The Pulteney Distillery is the most northerly on the British mainland. It is situated further North than Kodiak Island Alaska! The Spectrum WK217 expression is a "travel retail exclusive" and therefore not available in the shops. This duty free only expression is named in honour of a historic boat from around 1920 made in Wick called The WK217 'Spectrum'. This expression is has no age statement and comes in a litre bottle. It has been matured in ex American casks and Spanish ex sherry butts. The colour is a dark amber. I was bought this bottle as a gift and the fact it's 1 litre means it's a gift that keeps on giving. I have had it open nearly 5 months and the air has opened it up slightly. I have found adding water doesn't help releasing flavour profiles so this review is done neat and at 46% it's about right. So, enough preamble, let's go! Palate: Lots of lovely sweet honey upfront. Salty, drying oak, moving into sultanas, dried fruits, and a spicy tail. The finish is medium and the saltiness makes me salivate and the spiciness tingles my gums and tongue. The honey remains. A long time passed since the last OP I reviewed (almost exactly the same time last year) the Row to the pole. And here is another Duty free only OP, this time named after another wick ship: the WK 217 ‘Spectrum’.The inspiration for the last installment came from WK217 ‘Spectrum’. She was built in 1920 and went down in local history as one of the first Wick drifters to use a pioneering method of fishing called Anchor Seine Netting . She was also used during World War II for harbor service duties. Old Pulteney WK217 ‘Spectrum’ was distilled and matured at Pulteney, the most northerly distillery on Scottish mainland. American and Spanish oak ex-sherry butts were used in the ageing process. The whisky has not been chill-filtered or artificially coloured. 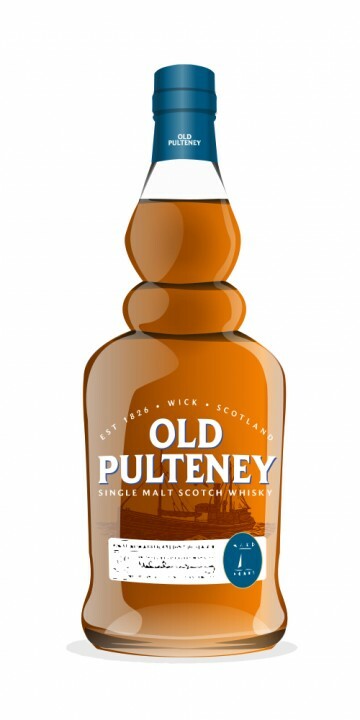 Old Pulteney WK217 has a premium strength of 46% ABV and is available in 1 liter bottles. Nose: Sweet , with toffee, sherry notes and some dried fruit, Carmel, sugar, but with a dash of salt, and wee brine. Also some dirty notes of kerosene on top of sultanas, and maybe a hint of mint. Palate: Sherry on top of a spicy edge, with dark chocolate, sultanas in liquor, some wood, with a briny undertone as the nose promises. hint of smoke. Finish: dark chocolate, rum dipped raisins. sugar. wee smoke. I love those sherry briny, dirty kind of notes, and if you do, you’re in for treat. A real nice one for decent price, so I you are flying anytime soon, give it a try if u like. I know I will.